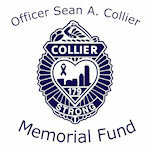 The Officer Sean A Collier Memorial Fund is a nonprofit 501(c) 3 tax-exempt organization established in memory of MIT Police Officer Sean Collier, who was killed in the line of duty on April 18, 2013 in the aftermath of the attack on the Boston Marathon. We hope to carry on Sean’s deep personal and professional commitment to service, connection and support for others. The Fund awards grants to local public police departments and non-profit groups to support the development and implementation of community programs designed to build connections between law enforcement and the communities they serve. Programs supported include but are not limited to Community Sporting Events, R.A.D trainings, National Night Out celebrations, Coffee with a Cop and Shop with a Cop. The mission of the Officer Sean A. Collier Memorial Fund is to foster connections between law enforcement and the communities they serve. Through community programming, people of all ages and walks of life will develop a deeper connection with, stronger support for, and better understanding of law enforcement officers and the role they play in the community. The Officer Sean A Collier Memorial Fund is funded exclusively through the generosity of our supporters. The majority of our funding is raised during two annual events – the Boston Marathon and the Sean A Collier Memorial Golf Tournament. Throughout the year, the Fund is grateful to be the recipient of individual donations from the law enforcement community, supporters, and those who are simply inspired be Sean’s commitment to service and wish to help carry on his legacy. The Fund will accept written grant proposals from local public police departments and non-profit groups providing mentorship, civic/service, athletic, recreational, enrichment and educational opportunities. The number of grants and the amount of each award will be determined on an ongoing basis each grant-making cycle, depending on available resources. The Memorial Fund is a completely volunteer organization, and we rely on your donations to help make the public aware of the dangers faced by law enforcement officers and first responders in their jobs and the oath they took to run towards danger so that we might all remain safe. Our Tax ID Number is 81-3733988.